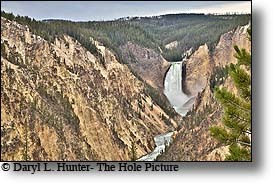 Yellowstone National Park has to many attractions to mention but I will offer up a few. Winter, spring, summer, or fall all offer their seasonal wonders. 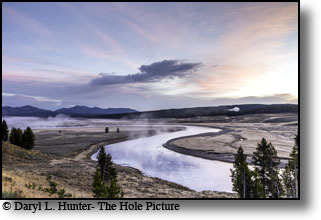 Yellowstone’s Grand Circle is a rough figure "8" shape that forms the interior roads within Yellowstone. The upper loop of the figure "8" circles Mammoth Hot Springs, Tower-Roosevelt and Canyon Junction and Norris Junction then back to Mammoth. It is roughly 70 miles in circumference. The communities of Mammoth and Gardiner, MT, at the Northeast gate, Silver Gate and Cooke City, MT, from the Northeast gate. But if you are connecting from the east gate (Cody), south Gate (Jackson) or west gate (West Yellowstone you will connect to the upper loop through the lower loop. 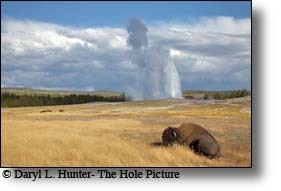 The Lower Loop of Yellowstone’s Grand Loop I the more popular loop as it has the lion’s share of Yellowstone’s thermal features, Old Faithful being one of them as well as Yellowstone Lake and the Grand Canyon of the Yellowstone. There are more things to see on this loop that you could see in a week so I will cut to the chase so you are sure to see the three most important features. 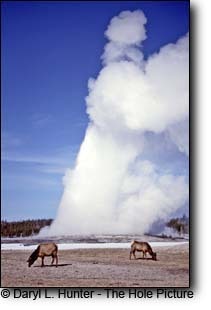 1.Everyone has to see Old Faithful once. 2. The Fountain Paint Pots trail showcases all four types of thermal features in a half-mile walk and is home to the largest Mudpot. 3. The most breathtaking and most often missed place in Yellowstone is Lower Yellowstone Falls at the Grand Canyon of the Yellowstone, this is always the highlight of all of my tours in the geological wonder category. Be sure to see these three things. The Lower Falls is the tallest waterfall in the park at 308 feet. 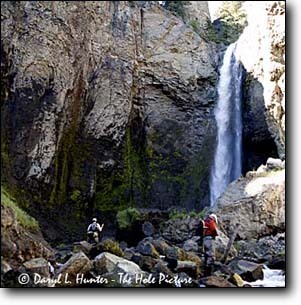 The arrow at the top of the photo points at a group of visitors on the platform at the Brink of the Lower Falls. Over the years the estimates of the height of this falls has varied dramatically. In 1851 Jim Bridger estimated its height at 250 feet. One outrageous newspaper story from 1867 placed its height at "thousands of feet". A map from 1869 gives the falls its current name of Lower Falls for the first time and estimates the height at 350 feet. 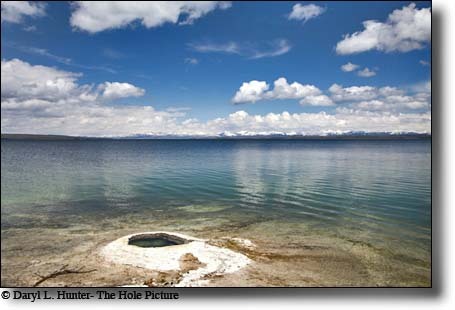 In the heart of Yellowstone Park is a giant blue gem called Yellowstone Lake, not a very imaginative name, but appropriate. Yellowstone Lake is the largest lake at high elevation (i.e., more than 7,000 ft.) in North America with a surface area of about 84,000 acres of 132 square miles; it is a natural lake, situated at 7,733 ft above sea level. To the east of Yellowstone Lake are the snow-capped peaks of the Absaroka Mountain Range and to the north the Beartooth Mountains grace the skyline; its kind of like Lake Tahoe except with geysers on its beaches. The Yellowstone Lake is a beautiful, clear and deep, body of water. In the center of our countryês first National Park. Long a favored destination for park visitors, Morning Glory Pool was named in the 1880s for its remarkable likeness to its namesake flower. However, this beautiful pool has fallen victim to vandalism. People have thrown literally tons of coins, trash, rocks, and logs into the pool. Much of the debris subsequently became embedded in the sides and vent of the spring, affecting water circulation and accelerating the loss of thermal energy. Through the years Morning Glory's appearance has changed as its temperature dropped. 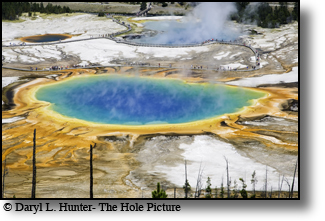 Orange and yellow bacteria that formerly colored only the periphery of the spring now spread toward its center. Mammoth Spring is a favorite not only because of its wide range of bright colors but also for its ornate travertine formations. Since the 1890s, when records were first kept on the activity of Mammoth Hot Springs, Minerva has gone through both active and inactive periods. For several years in the early 1900s, it was completely dry, but by 1951 reports state that Minerva was again active. During some cycles of activity, water discharge and mineral deposition have been so great that boardwalks have been buried beneath mounds of newly deposited travertine. Consequently, an elevated and movable boardwalk now spans the hill in the vicinity of Minerva. In recent years, hot spring activity has shifted dramatically from Minerva to other features on the Lower Terraces, and back again. 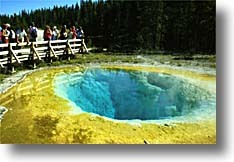 Grand Parismatic Spring is the largest of Yellowstone's hot spring pools. Where hot water is limited and hydrogen sulfide gas is present (emitting the "rotten egg" smell common to thermal areas), sulfuric acid is generated. The acid dissolves the surrounding rock into fine particles of silica and clay that mix with what little water there is to form the seething and bubbling mudpots. 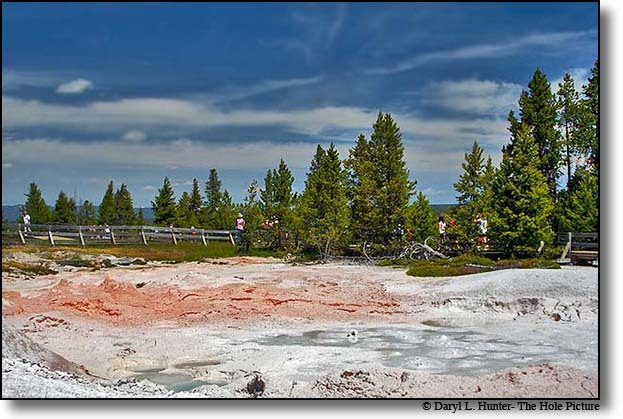 The sights, sounds, and smells of areas like Artist and Fountain paint pots and Mud Volcano make these curious features some of the most memorable in the park. 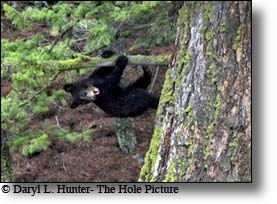 During the last 23 years (1980-2002), bears have injured 32 people within YNP. 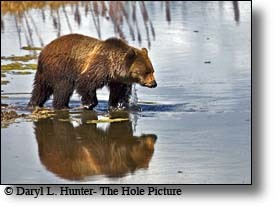 Grizzly bears and black bears were involved in 25 (78%) and 4 (13%) of the injuries, respectively. The species of bear could not be determined for 3 (9%) of the injuries. Three injuries occurred within a developed area, 2 occurred during a bear management handling accident, and 27 occurred in backcountry areas. Of the people injured while hiking, 57% were hiking off-trail. All (100%) backcountry hiking injuries involved people hiking in groups of less than 3 people. Bear Management Area restrictions reduce the chance of bear/human encounters and the risk of bear-caused human injury in areas with known seasonal concentrations of grizzly bears. 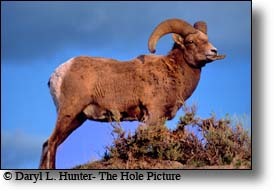 Winter visitors to the park still enjoy watching and photographing bighorns along the cliffs between Gardiner and Mammoth, as they did 80 years ago. 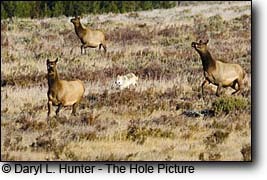 Annual surveys of bighorn indicate that the resident herd on Yellowstone's northern range consists of at least 150-225 animals. Summering bands are found in the Gallatin and Washburn Ranges, the Absarokas, and occasionally in the Red Mountains. On Dunraven Pass, a section of the Grand Loop Road in the park, a band of ewes and lambs has become somewhat habituated to summer traffic. 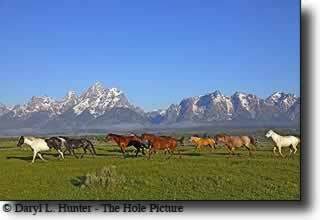 Yellowstone is known world wide as a world class trout fishery. Because of the increasing number of anglers in the park, more restrictive regulations have been adopted in Yellowstone. These restrictions include: season opening/closing dates, restrictive use of bait, catch-and-release only areas, and number/size limits according to species. A few places are closed to the public to protect threatened and endangered species, sensitive nesting birds, and to provide scenic viewing areas for visitors seeking undisturbed wildlife. Guide services are available for those that want to guarantee their success and maxamize their catch. 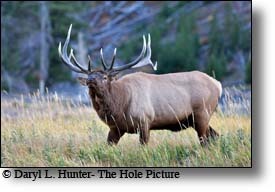 Moose (Alces alces shirasi Nelson), the largest member of the deer family, were reportedly very rare in northwest Wyoming when Yellowstone National Park was established in 1872. Subsequent protection from hunting and wolf control programs may have contributed to increased numbers but suppression of forest fires probably was the most important factor, since moose here depend on mature fir forests for winter survival. 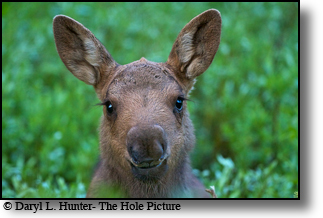 Surveys in the late 1980s suggested a total park population of fewer than 1000 moose. Moose are commonly observed in the park's southwestern corner along the Bechler and Falls rivers, in the riparian zones around Yellowstone Lake, in the Soda Butte Creek, Pelican Creek, Lewis River, and Gallatin river drainages, and in the Willow Park area between Mammoth and Norris. Yellowstone is the only place in the lower 48 states where a population of wild bison has persisted since prehistoric times, although fewer than 50 native bison remained here in 1902. Fearing extinction, the park imported 21 bison from two privately-owned herds, as foundation stock for a bison ranching project that spanned 50 years at the Buffalo Ranch in Yellowstone's Lamar Valley. Activities there included irrigation, hay-feeding, roundups, culling, and predator control, to artificially ensure herd survival. 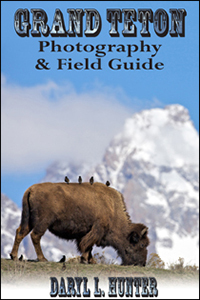 By the 1920s, some intermingling of the introduced and wild bison had begun. With protection from poaching, the native and transplanted populations increased. 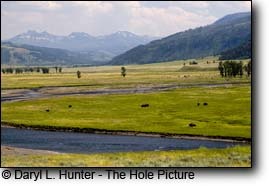 In 1936, bison were transplanted to historic habitats in the Firehole River and Hayden Valley. In 1954, the entire population numbered 1,477. Bison were trapped and herds periodically reduced until 1967, when only 397 bison were counted parkwide. All bison herd reduction activities were phased out after 1966, again allowing natural ecological processes to determine bison numbers and distribution. Although winterkill takes a toll, by 1996 bison numbers had increased to about 3,500. Glistening under a thick blanket of snow, winter in Yellowstone is a magical place teeming in wildlife and primal beauty, all without the usual tourist crowds of summer. 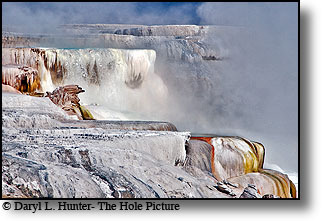 The Yellowstone's 10,000 hydrothermal features provide an eerie contrast to Yellowstone's icy winter landscape. 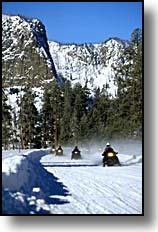 A snowmobile visit to Yellowstone National Park will create a treasured memory for a lifetime. Hop on a snowcoach and leave the over-snow driving to somebody else. 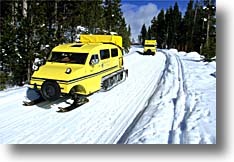 Snowcoaches have been operating in Yellowstone National Park since 1955 providing a warm passage into Yellowstone's winter wonderland. Today, guided snowcoach tours and ski and snowshoe shuttles are available at Mammoth Hot Springs, Old Faithful Snow Lodge, West Yellowstone and Flagg Ranch outside the South Entrance. 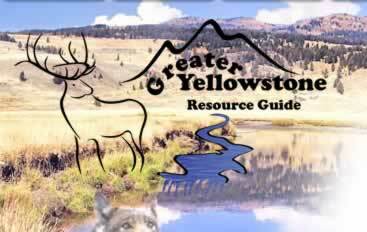 Most of Yellowstone is backcountry and managed as wilderness; many miles of trails are available for skiing. Track is set only on a few trails. 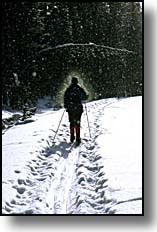 All unplowed roads and trails are open to cross country skiing and showshoeing. When skiing on unplowed roadways used by snowmobiles, keep to the right to avoid accidents. Old Faithful erupts more frequently than any of the other big geysers, although it is not the largest or most regular geyser in the park. Its average interval between eruptions is about 91 minutes, varying from 65 - 92 minutes. An eruption lasts 1 1/2 to 5 minutes, expels 3,700 - 8,400 gallons (14,000 - 32,000 liters) of boiling water, and reaches heights of 106 - 184 feet (30 - 55m). It was named for its consistent performance by members of the Washburn Expedition in 1870. Although its average interval has lengthened through the years (due to earthquakes and vandalism), Old Faithful is still as spectacular and predictable as it was a century ago. 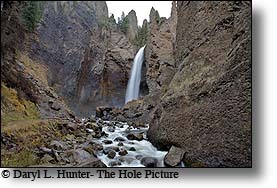 Tower Fall's 132-foot drop of Tower Creek, framed by eroded volcanic pinnacles has been documented by park visitors from the earliest trips of Europeans into the Yellowstone region. Its idyllic setting has inspired numerous artists, including Thomas Moran. His painting of Tower Fall played a crucial role in the establishment of Yellowstone National Park in 1872. The nearby Bannock Ford on the Yellowstone River was an important travel route for early Native Americans as well as for early European visitors and miners up to the late 19th century.